We received an invitation to this conference. Three times even! We declined. 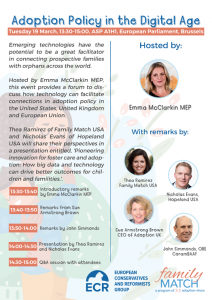 We informed MEP McClarkin that the people and organisations she invited as presenters, are part of a fierce adoption lobby. Hopeland US was initially co-founded by the now defunct Joint Council on International Children’s Services, the trade organisation of the US adoption agencies. Their ideas are not compliant with the UN Convention on the Rights of the Child. The UNCRC is the EU’s legal basis (acquis). So, let’s keep those forces far away from the EU.